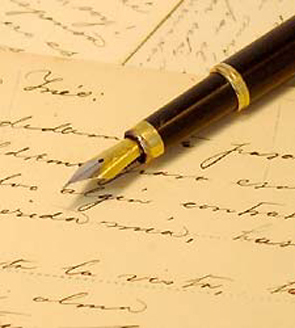 The Forgotten Art of Letter Writing".. I never met Begum Hafiza, my paternal grand mother, the grand daughter of the Nawab of Gandara. A woman of reputed startling beauty, five foot ten inches tall, she was married to my grand father Syed Yousuf Ali, a Judge from Hyderabad Deccan, three inches shorter to her in height. He was the scion of the family of Hazrat Syed Shah Abdul Razaqq Banswi of Bansa Sharif to whom the House of Fareangi Mahal were designated Khalifas. She died an early death, way before my father was married. My father, and his two brothers, were brought up by my eccentric grand father in a house with no female presence. I came to know this amazing woman through her letters written to my father. At that time, she was still in Hyderabad Deccan, with her husband, my father had come to Pakistan, to look for a job. A young man in his very early twenties. Going through my father's library, I came across the bundle of letters, that revealed my grandmother to me. The family politics. I laughed, I cried & smiled as I read those letters. To this day, they remain a cherished possession, locked away in a box that originally belonged to my paternal grandfather. Her love for my father, whom she called Chand, and Chand he remained for the rest of his life, reflected itself in her writings, every four days delay from my father in sending a letter to her, merited at least two from her expressing her concern at the delay. In a letter dated 1st October 1958, she expressed her concern at my father's health, a friend having met him & upon his return to Hyderabad Deccan, having reported his having lost weight. There is always the loving mention of Bitton, a closely related Aunt for which she had a fondness for. Indecently, she happens to be the mother of Gen - Talat Masud. My youngest Uncle Syed Mehdi Ali Razzaqi, a poet ,well known for his compilation of "The Goddess", his book of poetry, which won him an Award by the then President of Pakistan(once he too migrated to Pakistan), often put quaint notes at the bottom of my grandmother's letters, that are hilarious and a piece of literature in themselves. And, in that pile of letters were many by my grandfather, Syed Yousuf Ali, in his very perfect English. He had the honor of being the first Muslim to get a First Class First Position from Aligarh University in English Literature. His first degree. I am told, his picture still hangs today in the library of Aligarh University. Also in the letters, was the one, he wrote on my birth, on 4th April 1962. A beautiful piece of art, it opens with, "My dear Daughter-in-Law Begum Kaisar Aftab Ali, gave birth to a Daughter, by the Grace of God. May all joys, health & happiness attend- a Shahzadi(princess), in the third generation of the "House of Nizam"(Senior Branch in the Direct Line of Precedence)." In another letter dated 7th August 1953, he writes to my father," Now that the winter season is coming up, how are you exactly situated with your proper gear there? It was a mistake of mine, not to have kept here, your coat measurements, let me know the measurements, which can easily be done up by the tailor in a jiffy." What a link between our past & us.The past stood arrested in these letters in all it's truthful brilliance.